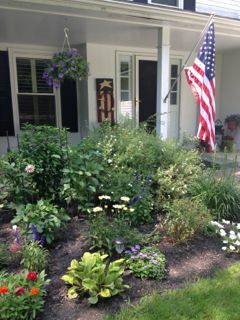 I was greeted by Jackie and her husband Lee, into their beautiful veggie and flower garden. There home is in Penfield, New York, a suburb of Rochester, New York. 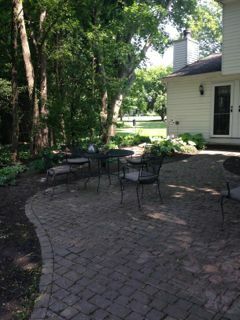 The front of the house and a good portion of the back yard is filled with beautiful perennials. Along with managing all these flowers she has a very productive vegetable garden in the back yard. 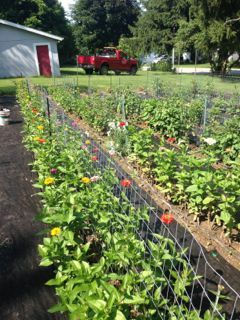 Jackie has lived in this house for the past 30 years, and since her retirement from working in the school system 4 years ago she now as the time to put into making her veggie and flower garden beautiful and productive. 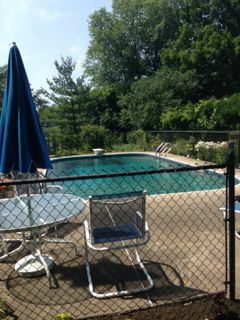 As we walked around to the back of the house I saw a beautiful pool surrounded by lush plants with colourful blooms. Leading from the back door is a beautiful shaded patio with several Hosta and other small shade loving shrubs and perennials. 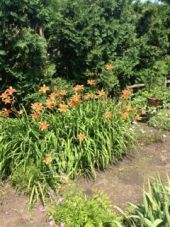 Along the pool I saw tiger lilies, daisies and dahlia, just a few of a huge variety of perennials and small shrubs Jackie has planted. 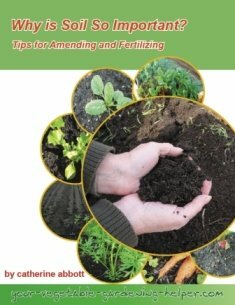 She said she has no set plan when she plants her perennials and often moves them around. 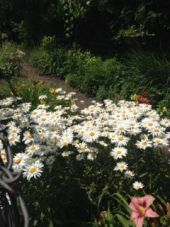 She said she had just gone to a talk on planting a cottage style garden where the plants are grown more closely together and the types chosen cover the ground smothering out any weeds. Something new to consider on her to do list. 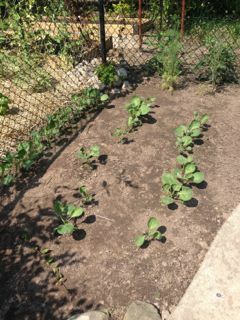 As we got to the back the pool Jackie started pointing out the patch of Brussels sprouts, her first time planting these. 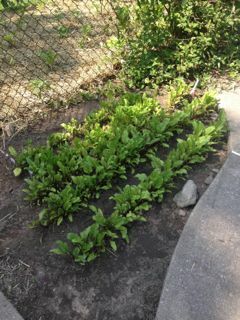 Then there were a couple rows of spinach, which we enjoyed some of for dinner. We went through another gate and entered into her main garden area. 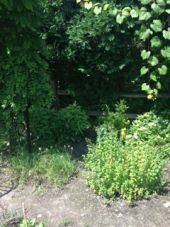 This garden area was probably 10 feet by 20 feet, enclosed with a deer netting fence. 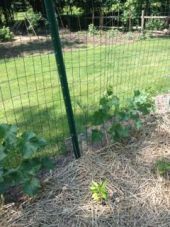 The ground was totally covered in straw, her experiment this year, to see if the straw mulch would help to keep the weeds down. It certainly looked like it was working, as there were no weeds that I could see. She mentioned she did use hay in the past, like most of us probably have until we realize that hay usually has lots of weed seeds that just give our gardens more weeds. 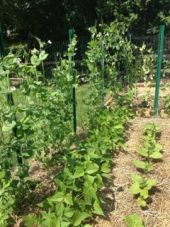 In this area she was growing tomatoes (which from transplants she got from one of her daughters who also grows her own veggies), peppers, lettuce, peas, and beans. She mentioned that my website had been helpful to her in planning how to rotate her vegetables. One area was a bit shaded by a honeysuckle bush, so she was thinking of moving it so, she could more easily rotate in this area. 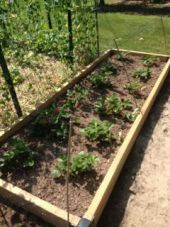 In another area were 2 raised beds, one filled with strawberry plants, the other with carrots. The carrots were another experiment this year as she had not been that successful with them before. She is hoping the raised bed will help, but not sure as the carrots did not germinate very well and were growing very slowly. 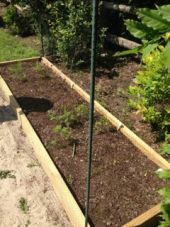 Behind the raised beds, along the fence were her blueberry bushes. They were young and just starting to produce. 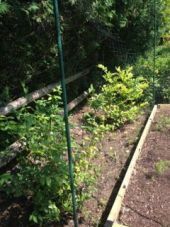 Both the blueberry bushes and the raised beds were protected by a deer fence as well. Along with deer nipping at their veggies they also had a ground hog. Being resourceful they found the entry and exit hole, they plugged both with large rocks and smoked the ground hog out. They have not had any problem since. Jackie had lots of questions about compost, as she had a large pile at the end of her yard. 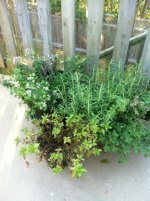 She has mature trees so the leaves are plentiful in the fall and has a large area of grass, so grass clippings are plentiful in the summer. She would just pile the leaves in the fall and the grass clippings in the summer. It was making compost, however the pile was intimidating. I suggested she try to manage the pile by layer the nitrogen and carbon materials and making sure that the pile is getting enough moisture. We chatted about what was nitrogen material (food waste, grass clippings, plant debris) and what was carbon (leaves, twigs, straw). 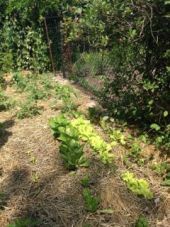 Jackie’s yard is well kept and managed; obviously a lot of time, energy and love goes into making it a beautiful veggie and flower garden. 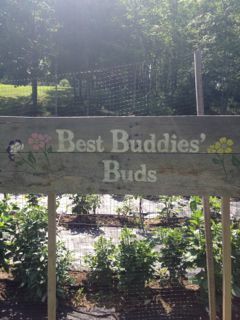 Last year Jackie and two of her friends started “Best Buddies' Buds“ a dahlia growing business that supplies their local customers with tubers, plants and they also make flower arrangements for special events. With some trial and lots of research and talking with other dahlia growers they are making a successful small business of it. There were some beautiful flowers just starting to bloom when we walked around this garden area, which was just a few minutes from Jackie’s home. Jackie also took me for a little tour of a community garden; Rochester and the surrounding area has several community gardens, which have become very popular over the last few years. We also walked through Highland Botanical Park, where a Lilac festival is held every spring, sorry I missed that as lilac are one of my favorite flower scents. After we had a lovely dinner we all sat down and watch a Hallmark movie, another one of my favorite things to do to relax. I had a lovely stay in this veggie and flower garden. Thank you Jackie and Lee for your warm hospitality. 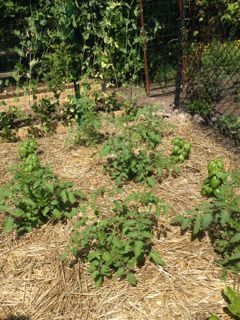 Return from Veggie and Flower Combo Garden to Organic Vegetable Garden.